Apple Stores — all 300+ of them — have allocated quantities of the new iPad that will be available for purchase tomorrow. And all of them are planning to open at 8:00 a.m., local time. Most stores already have lines of eager Apple fans lining up outside, though this is more prevalent in the biggest stores. 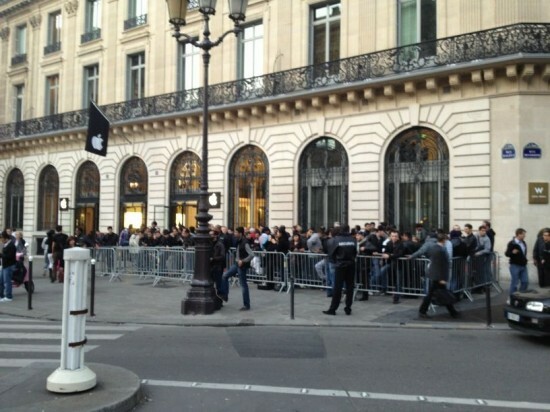 Smaller stores won’t have as many shoppers camping out overnight to wait for the iPad 3 to go on sale; but by the same token, those smaller stores aren’t likely to have as many new iPads for sale. If you don’t feel up to braving the line outside your local Apple Store, you do have other options. A handful of select Apple retail partners are getting their own supply of new iPads, but just how many they’ll have is an open question. I’d bet on it being less than Apple Stores are getting — possibly a lot less. Still, these stores aren’t likely to have lines wrapping around the block outside, so you stand a decent chance of getting an iPad if you get there first thing in the morning. Also, the 3G/4G models will be in stock at AT&T and Verizon stores, but you can count on their supplies being small. International fans take note that only 10 countries are getting the new iPad on Friday, including the U.S. The other nine are Australia, Canada, France, Germany, Hong Kong, Japan, Singapore, Switzerland, and the U.K. Third-party retail partners haven’t been formally announced for these nine countries, but it’s just been revealed that the long-awaited Apple Store inside Harrod’s of London is having its grand opening at 10:00 a.m. local time, to celebrate the new iPad’s launch. Other countries will be getting the new iPad on Friday, March 23rd. These include Austria, Belgium, Bulgaria, Czech Republic, Denmark, Finland, Greece, Hungary, Iceland, Ireland, Italy, Liechtenstein, Luxembourg, Macau, Mexico, the Netherlands, New Zealand, Norway, Poland, Portugal, Romania, Slovakia, Slovenia, Spain, and Sweden.